In the first part, she took a pill prescribed for catatonia, a condition in which a person’s muscles are immobilized and remain in a single position for hours at a time. 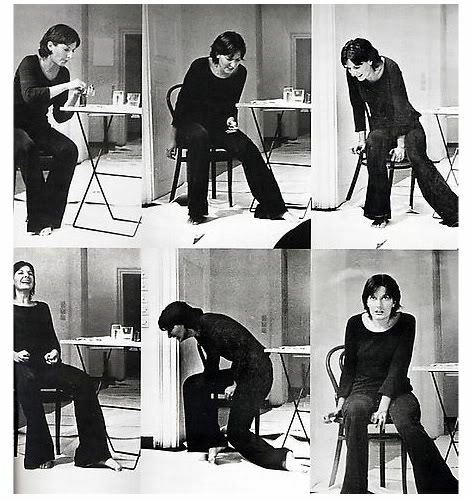 Being completely healthy, Abramović’s body reacted violently to the drug, experiencing seizures and uncontrollable movements for the first half of the performance. While lacking any control over her body movements, her mind was lucid, and she observed what was occurring. Ten minutes after the effects of that drug had worn off, Abramović ingested another pill—this time one prescribed for aggressive and depressed people—which resulted in general immobility. Bodily she was present, yet mentally she was completely removed. (In fact, she has no memory of the lapsed time.) This project was an early component of her explorations of the connections between body and mind, which later took her to Tibet and the Australian desert Following Rhythm 2, she set to develop the rest of the series of rhythm projects, continually testing her endurance.